Back in the late 1960s, when I was about 16, I went youth hostelling for a week with three school friends. One of our dads delivered us to a starting point and then left us to it, another dad collecting us at the end of the week. With rucksacks on our backs, we walked across parts of the Yorkshire Moors and Goathland, if I remember correctly. On some days we combined hiking with taking a bus for sections of the longer distances, and we wound up in Whitby. (The last time I'd been there, I was only four, so remembered very little about it.) We had a wonderful time in that beautiful town, with its abbey ruins overlooking the sea. And when we walked round the town we saw a glass-blower making little ornaments. 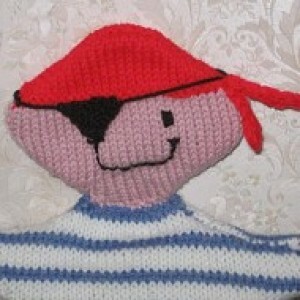 I watched him blow a little glass duck and had enough pocket money to buy one. 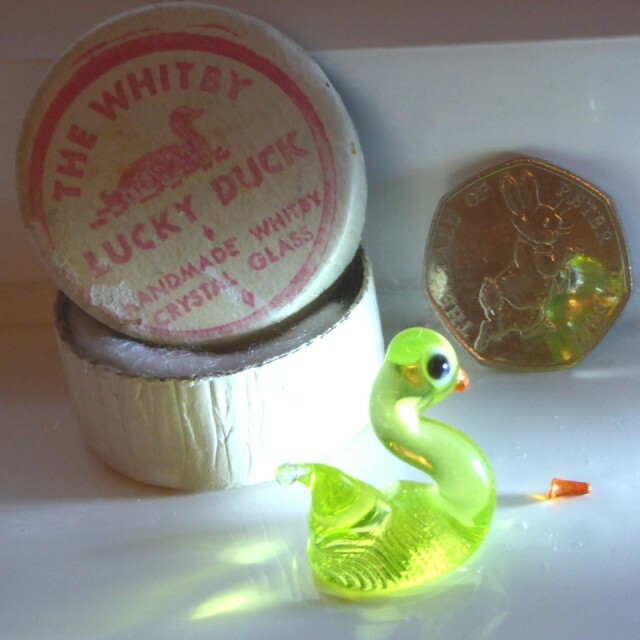 He came in this little box, marked The Whitby Lucky Duck - Handmade Whitby - Crystal glass. I managed to get him home in one piece and sat him on my bedroom window sill, where he'd catch the light. My bedroom was sparsely furnished - a bed and bedside cabinet, a dressing table, a small wardrobe and, against the wall just inside the door, a small bookcase. One morning, when I woke up and opened the curtains, I noticed my lucky duck had lost his little orange beak. I searched the floor and checked the curtains, in case they'd caught it, though they came nowhere near touching the ornament. I looked under the bed, checked my sleeves, footwear, school clothes and leisurewear. I checked my bed, every surface, including my bookcase, even though it was diagonally opposite my duck's end of the window sill, all without luck. You name it, I searched it, but there was no sign of my duck's tiny beak. She didn't know what I was talking about. She'd not been in my bedroom. She'd not done any dusting or hoovering. She certainly had not put the lost beak on my bookcase. All I know is - my duck must be lucky to have his lost beak returned to him. It remains a mystery to this day. Neither parent could shed any light on either the beak's disappearance or its reappearance. It was not in the nature of either of my parents to lie or even to tease me. My brother and sister had both left home. My door was kept shut and the cat had been nowhere near my bedroom either on the day the beak was lost, or the day it returned. So here ends the tale of the beak of the duck of Whitby luck! At the time of these events, Britain hadn't gone metric, so this 50p coin is an anachronism. I put it there for the sake of adding scale to my photograph, but found it also made a nice mirror for my lucky duck. Thank you for visiting my yesterblip. What a horrid contrast today's weather is - relentless heavy rain, and dark by 2pm. All around us the roads are like rivers. Ugh! 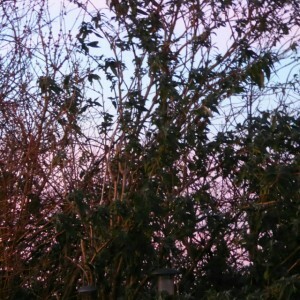 Thanks to Freyjad for hosting the Tiny Tuesday challenge.